Nick Taylor, Managing Director of Silva Timber Products and Sjoerd Bos, VP of Sansin, provide this advice on how best to finish decking. Whether you are a garden designer looking at a deck for a residential client, or an architect or landscape architect designing a deck for a bar or restaurant, it’s important to keep in mind that decks represent a unique situation with regard to wood staining. 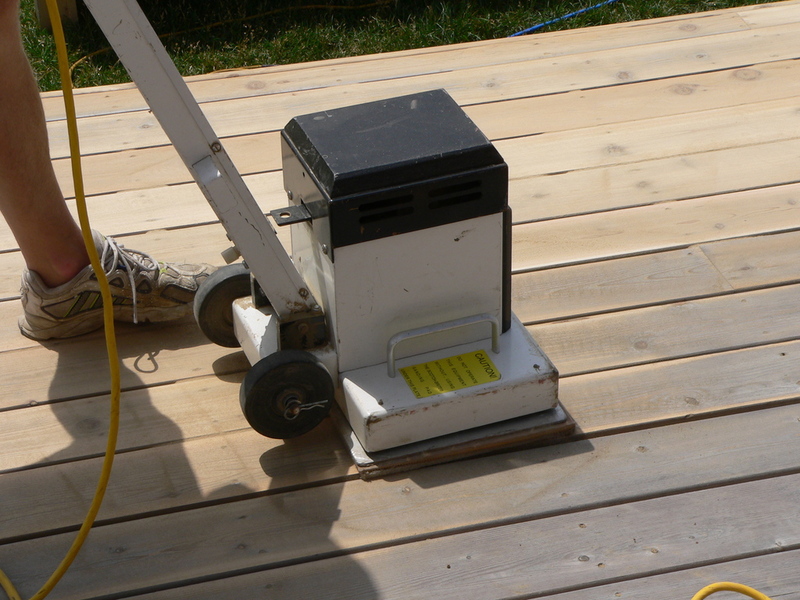 Decks endure foot traffic, have a horizontal orientation, and are often completely exposed to the elements. Film form wood finishes that may perform well on vertical surfaces, such as windows, will likely have trouble and require restoration, rather than maintenance, on horizontal deck surfaces. 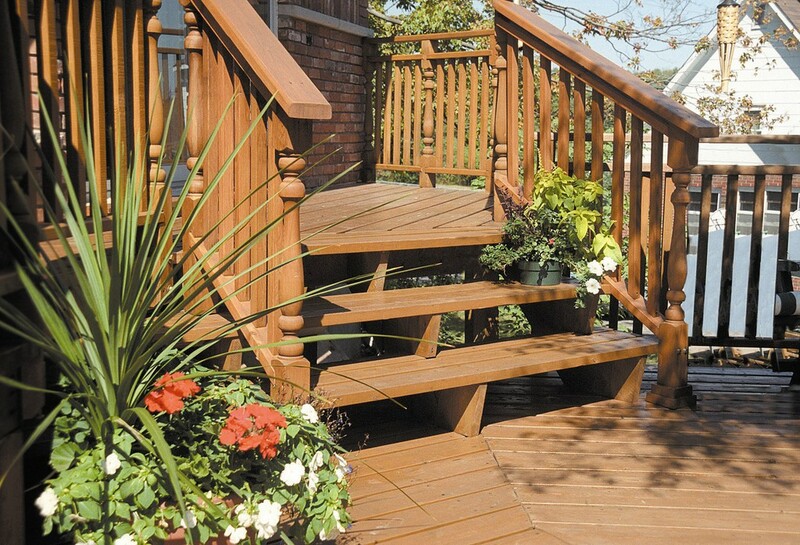 Critical decisions at the beginning of a project determine the cost and maintenance requirements for a deck project. When wood is used properly in the design process and consideration is given to the species of wood to be utilised, the preservation and finishing of wood could arguably require the least maintenance – making wood competitive with any other building material on the market. Whether a traditional or more eco-friendly stain is used, durability is likely to be the first concern. How long will the stain last? Although this is important, serviceability is even more important or at least equal in value. The objective is for a deck coating to wear gracefully, allowing for easy maintenance and recoating, so that maintenance is always a pleasant experience. Durability and ease of maintenance are greatly aided when the initial preparation and staining are done well. Whether re-staining or starting from scratch, here are some tips on how to prepare and coat the wood for best results. Traditionally, wood stains used oil-based solvents to coat the wood. For water repellency. These oil-based solvents often contain paraffins, which quickly break down with exposure to sunlight and heat. The move to water-borne stains combines the benefits of both oil and water-based coatings, using water as the vehicle to get oil penetration deep into the wood, which gives durable protection. These environmentally-friendly stains do not sit on top of the surface, meaning that they are not chipped or scraped away. Apply a biodegradable deck cleaner to remove any build-up, mould or mildew. Rinse the deck off with a hose (making sure plants surrounding the deck are covered), and let the deck dry thoroughly, making sure all signs of the previous coating are gone. This step may be time-consuming, but is worth the effort. An orbital sander with 60-80 grip paper should be sufficient to create a level, consistently porous surface that will absorb more stain, resulting in a better wood finish. Deck wood stains now come in ‘two-coat’ formulations that penetrate deep into the wood to repel condensed water while allowing water vapour to escape. It is best to apply the stain with a garden sprayer followed by ‘back-brushing’ to ensure an even, saturated coat. Use a wet film gauge to measure the amount of stain that has been applied to the surface, and refer to the coverage directions on the product. Selecting a colour is important when considering exterior maintenance, as the pigment loading will affect the performance of the coating. The more pigment, the longer it will last, as good quality pigments, particularly iron oxides, provide excellent UV protection. However, wood has a very attractive and distinctive character that most architects, landscapers and homeowners wish to retain rather than hide. With clear, or nearly clear coatings, new technologies use finely ground iron oxides, such as trans oxides or nano tints, to maintain clarity and enhance UV protection, even in a clearer coating. How long should your deck stain last? That’s a common question, and it does depend on the stain and the preparation as described above. 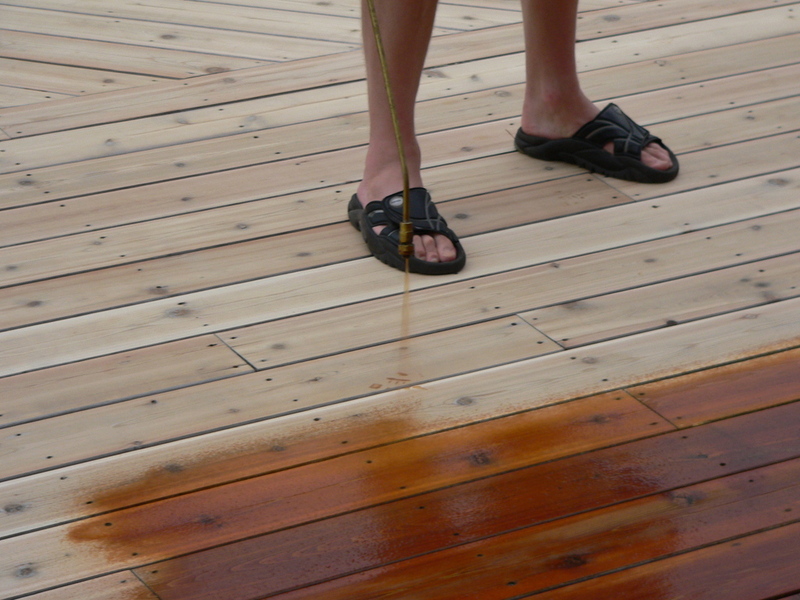 A good quality penetrating stain for decks should yield a two-to-five year maintenance cycle, depending on the pigment loading (transparent or opaque) and the exposure.